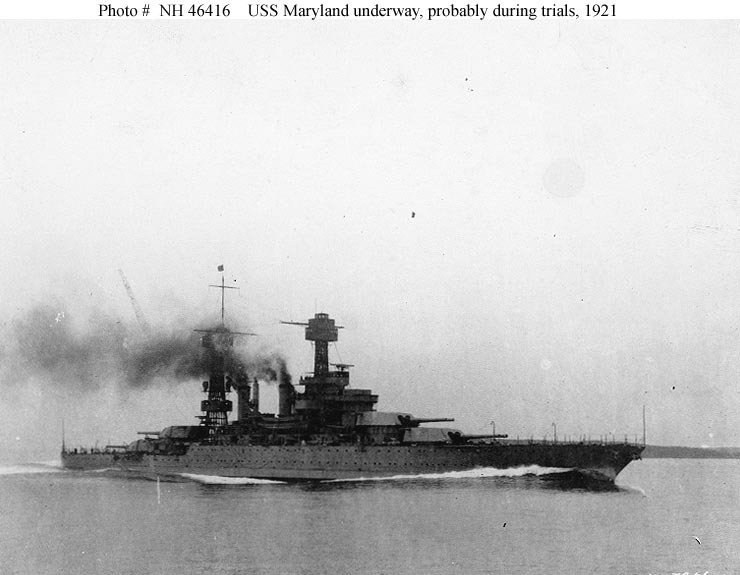 USS Maryland, a 32,600-ton Colorado class battleship, was built at Newport News, Virginia, and commissioned in July 1921. During the 1920s and 1930s, she participated in regular fleet training and combat exercises. 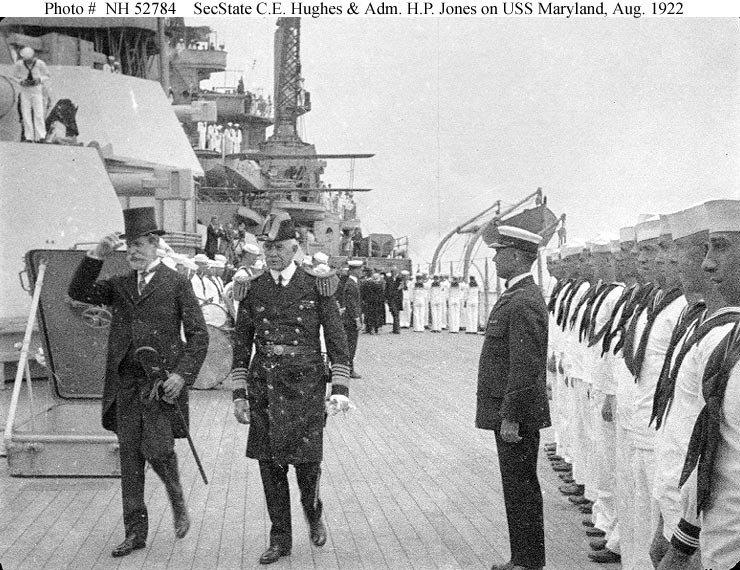 Maryland also made some notable long-distance cruises, including one to Rio De Janeiro in the Summer of 1922 to participate in Brazil's Centennial Exposition, the U.S. Fleet's trans-Pacific voyage in 1925, and President-Elect Herbert Hoover's 1928 good-will tour of Latin America. 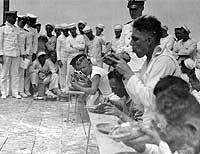 Maryland's base was changed from Long Beach, California, to Pearl Harbor, Hawaii, in 1940. 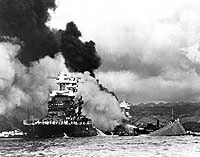 She was moored at Pearl Harbor when the Japanese struck on 7 December 1941, but received relatively minor damage. Following repairs and overhaul, Maryland operated with Task Force One off the U.S. West Coast in 1942, deploying to the South Pacific later in the year. She took part in operations to capture the Gilbert and Marshall Islands in late 1943 and early 1944, employing her sixteen-inch guns in the pre-invasion bombardments of Tarawa and Kwajalein. 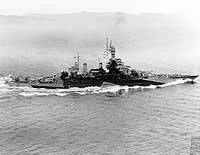 In June 1944, Maryland again participated in pre-invasion gunnery, this time against Saipan. 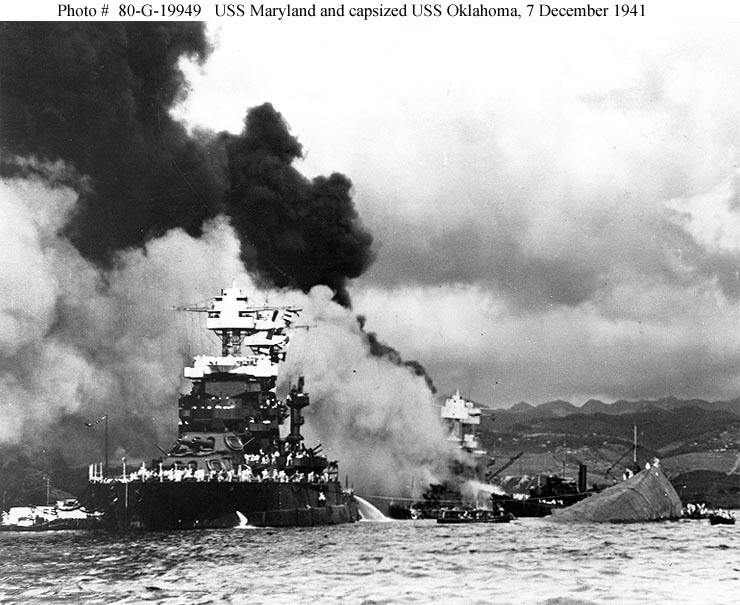 During this operation, she was torpedoed by a Japanese aircraft, necessitating a trip to Pearl Harbor for repairs. 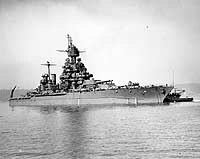 The battleship returned to action for the Palaus operation in September 1944. 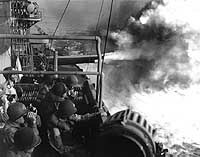 During the Leyte invasion in October, she bombarded enemy positions ashore and fired on Japanese warships during the Battle of Surigao Strait. 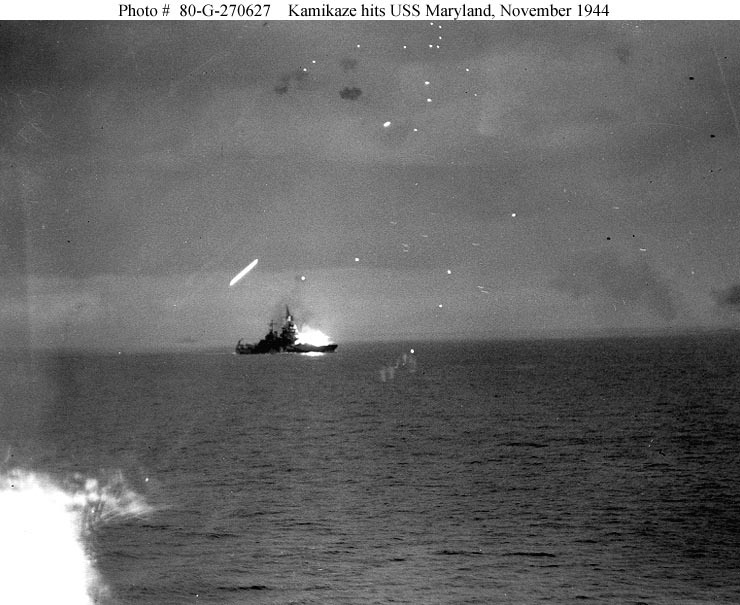 While operating off Leyte in late November, Maryland was damaged by a "Kamikaze" suicide plane. 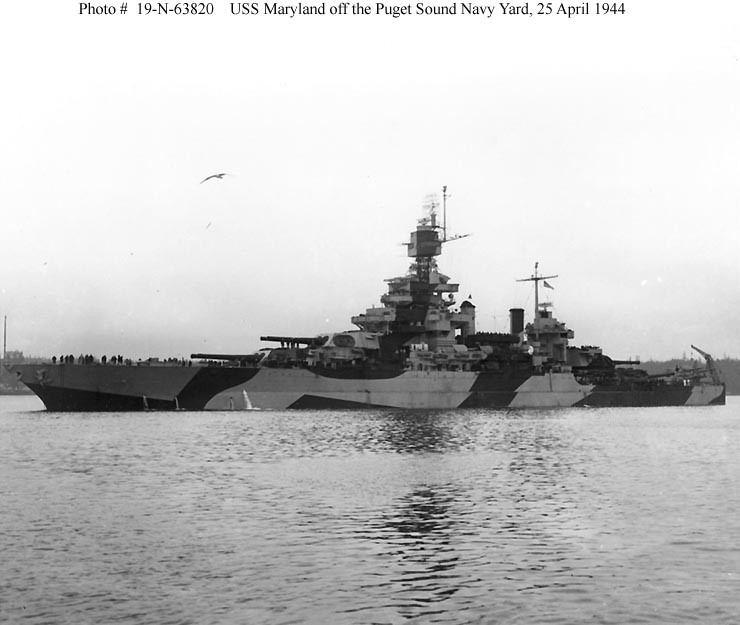 Maryland was repaired in time to participate in the Okinawa operation during March and April 1945, was again hit by enemy air attack on 7 April, but remained in action for another week. She then went to the West Coast for overhaul. This work was completed in early August, but the Pacific War ended before she could return to the combat zone. 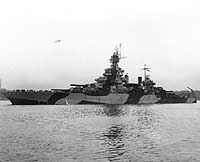 After spending the last months of 1945 transporting servicemen home from the mid-Pacific, Maryland went to Bremerton, Washington, for inactivation. She was decommissioned in April 1947 and remained in "mothballs" until July 1959, when she was sold for scrapping. 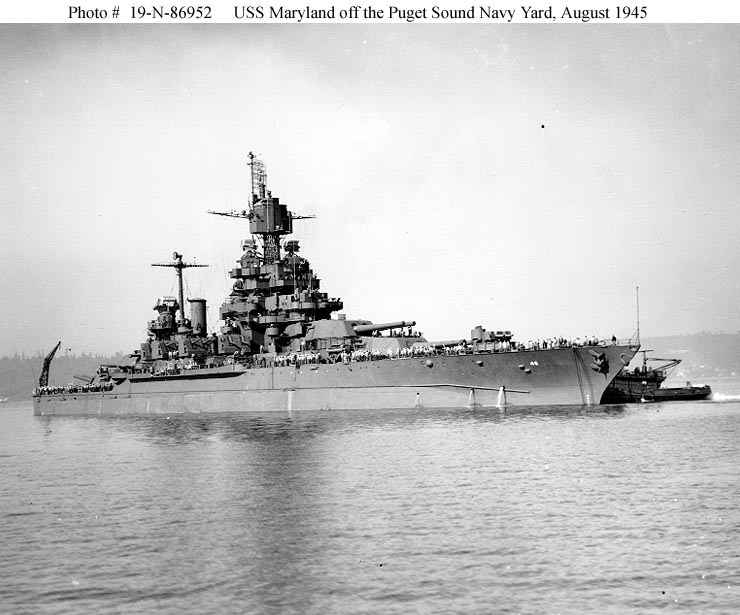 This page features selected views concerning USS Maryland (BB-46). 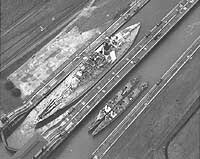 Damaged Ships after the Attack. Photographed in 1921, probably while running speed trials. 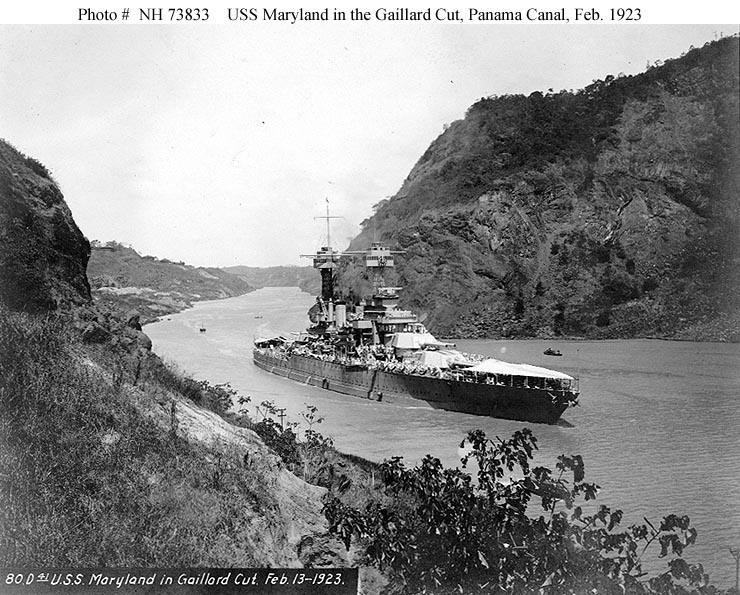 In the Gaillard Cut, Panama Canal, 13 February 1923. Courtesy of the Naval Historical Foundation, Washington, DC. 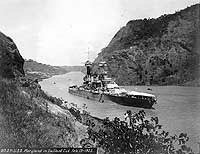 In the Miraflores Locks, while transiting the Panama Canal during the annual inter-ocean movement of the U.S. Fleet, 24 April 1931. 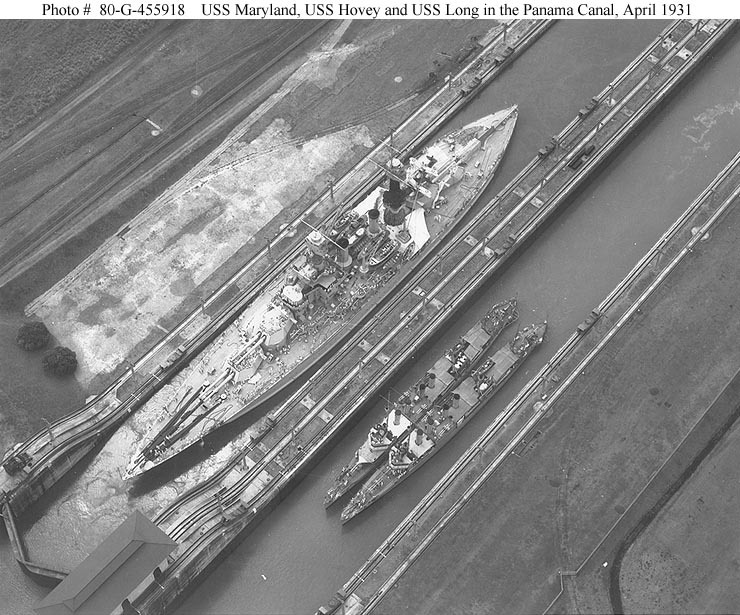 Note the twin 4"/50 gun mountings carried by Hovey and Long. 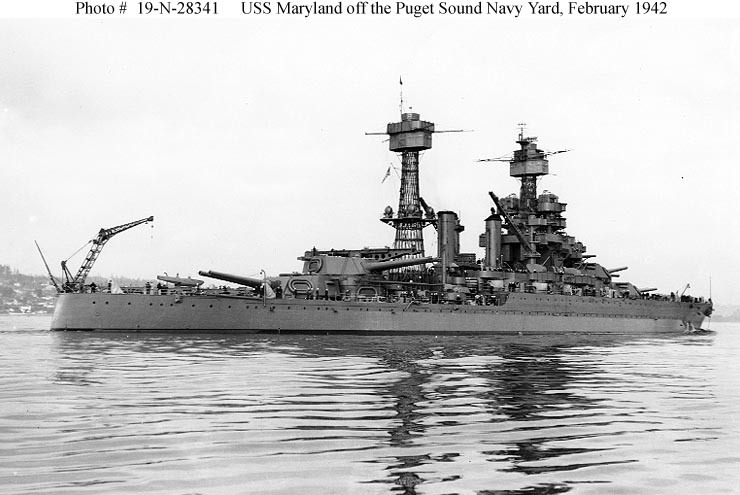 Off the Puget Sound Navy Yard, Bremerton, Washington, 9 February 1942. 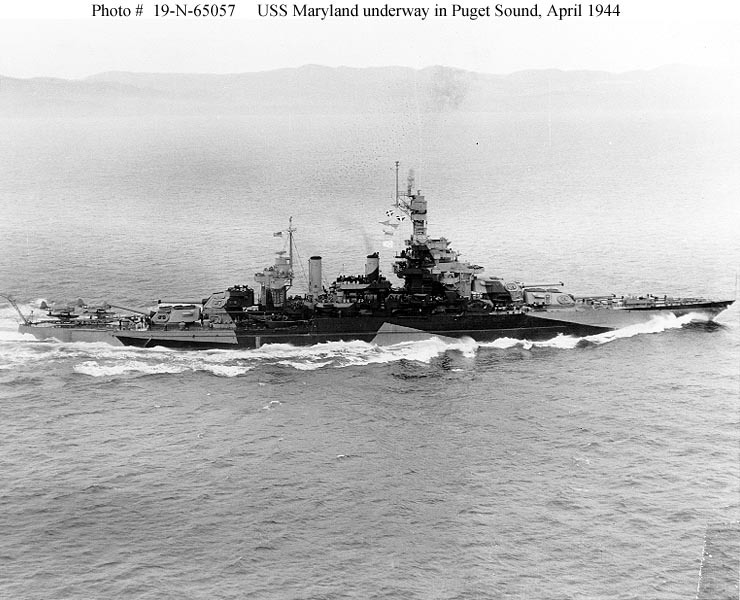 Off the Puget Sound Navy Yard, Washington, 25 April 1944. On board USS Maryland (BB-46) in August 1922, during her cruise to Rio de Janeiro to participate in the Brazilian Centennial Exposition. 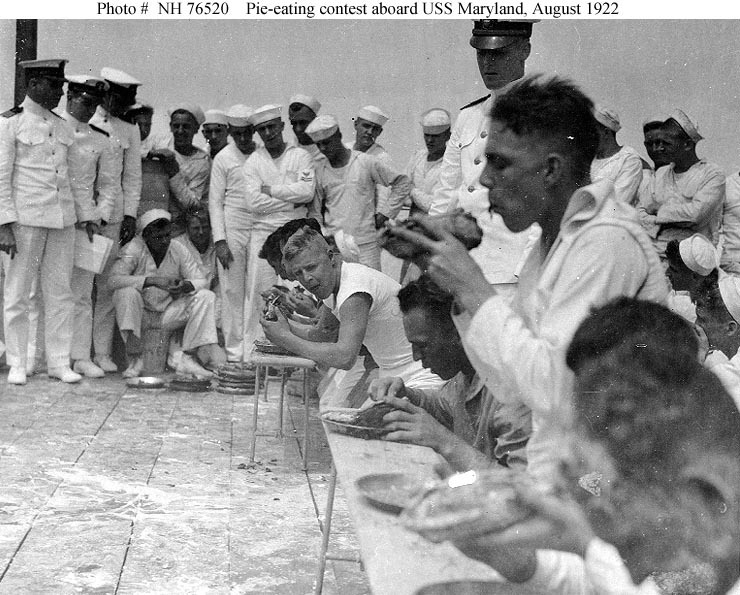 Pie-eating contest on board, during her cruise to Brazil in August 1922. Donation of Mrs. F.W. Brown, 1972. 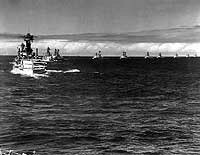 Of the eleven battleships seen here, making a starboard turn while steaming in column, USS Maryland (BB-46) is at left, closest to the camera. 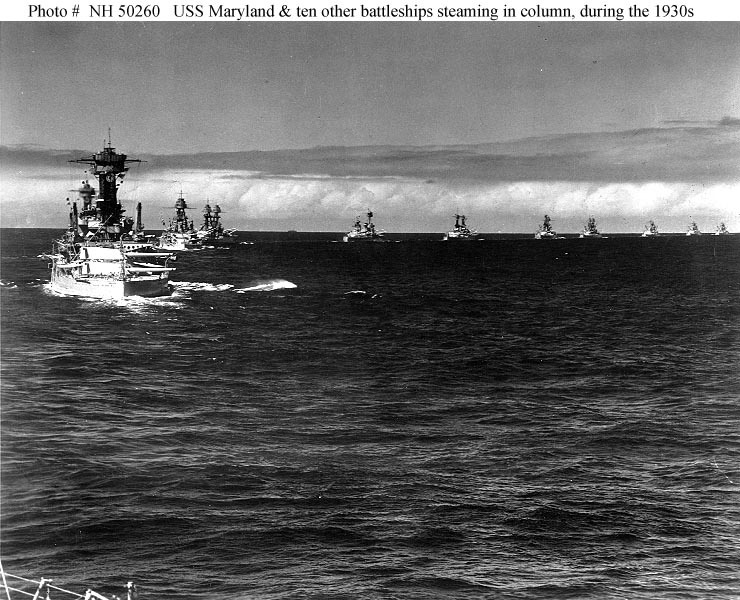 Leading the column are the three New Mexico class (BB 40-42) battleships. USS Maryland (BB-46) firing her after 16"/45 guns, during the pre-invasion bombardment of Tarawa, 20 November 1943. 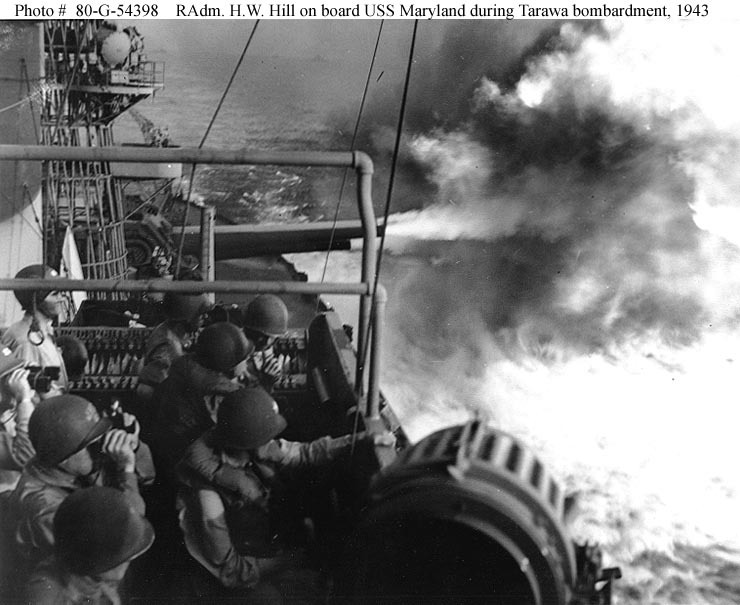 Rear Admiral Harry W. Hill, Commander, Task Force 53, and members of his staff are observing the bombardment from Maryland's port bridge, in the foreground. 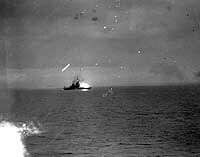 Is hit by a "Kamikaze" suicide plane in the evening of 29 November 1944, while operating off Leyte.